Executive Summary: Marid Audran is a freelance operator in the Budayeen, the anything-goes quarter of an unnamed Levantine city. But it's getting harder to stay independent--especially when you don't want to get your brain wired. Things get harder when a modified killer wearing the personality of James Bond offs a major crime boss. Then some freak starts offing Marid's friends. But are the killings connected? In order to find out, and stop the killer, Marid has to ally himself with feared boss Friendlander Bey and finally do the thing he's always dreaded--get himself wired. High-Tech: When Gravity Fails is centrally concerned with transhumanism, with cybernetic enhancements as mechanism. People can get cybernetic implants that can bestow skills (called "daddies"), like being able to speak a foreign language; or ones that impart whole personalities (called "moddies")--including those of figures from literature, history and popular culture. Low-Life: The first book of a trilogy starring Marid Audran, a streetwise hustler in the Budayeen--a rough-and-tumble red light district within an unnamed Levantine city. It feels like a cross between pre-war Beirut and New Orleans--specifically the French Quarter, where Effinger apparently spent some time. Most characters we meet in the Budayeen live on the margins of society--prostitutes, barkeeps, petty criminals and tourists looking for a thrill. But the Budayeen is also one of free spaces in which you can be whoever you want to be. Most characters in the book, as it happens, are transgender--it's never outright stated whether this is how things are in the future or just in the Budayeen. Dark Times: The Budayeen is located in an unnamed Levantine state. We don't really get much of a sense of what life is like outside, though Effinger peppers the book with references to more conservative norms operative outside the Budayeen, and we do learn that the West has largely fallen apart (though European and American individuals are often still wealthy). But aside from the dangers of living in a crime-ridden red light district and in a society essentially run by local mafias, it's not very dystopian. As in Gibson's Sprawl trilogy, the state is basically absent from the narrative. 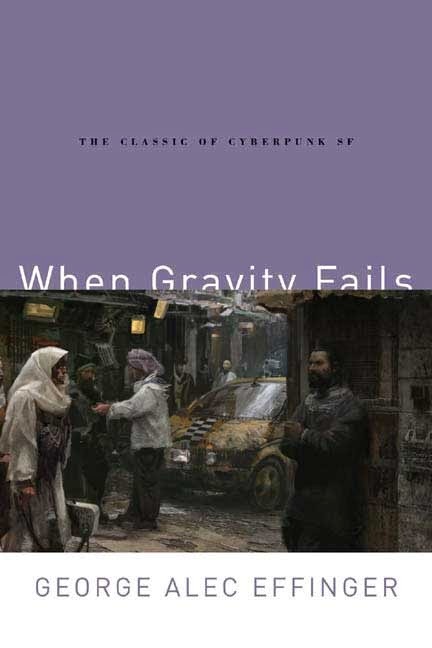 Legacy: When Gravity Fails garnered Hugo and Nebula nominations, but won neither--which is a shame, as it's one of the best, most enduring and fun examples of the cyberpunk approach. In Retrospect: The fact that When Gravity Fails falls on the transhuman-y side of cyberpunk, and has very little to do with computers, serves its durability well. So too does its fairly novel Middle Eastern setting--and the fact that the book has nothing to do with terrorism or religious extremism makes it feel really refreshing. In their place Effinger stresses oft-neglected elements of ethnic and religious custom in the region: hospitality, complex modes of address, the strategic use of flattery and so forth. The passages where Marid heaps praise upon crime lord Friedlander Bey are both wildly funny and quite serious--a tête-à-tête with potentially serious consequences for Marid if he makes a wrong move or stresses the wrong thing. The close quarters coexistence of "sin" and "faith" in a Middle Eastern city may also surprise readers whose view of Islam is largely informed by the crude stereotypes of the post-9/11 zeitgeist (and attempts by groups like ISIS to embody them). Effinger's Muslim characters, by contrast, tend to have a complex, fluid relationship to their faith--not uncommon in real-world analogues to the Budayeen. Some are deeply religious, others are not, but even the ones who are work to negotiate strictures of faith with the practical realities of daily life. Nor is religion treated with the disdain common in science fiction, where it is often framed as "superstition" or "anachronism." Marid, we are told, is not a religious man. But as he falls deeper into danger, he begins to reflect on his long-neglected faith. It gives him a degree of comfort and psychological protection, as it does for so many the world over. Effinger isn't endorsing a religious viewpoint or narrative, but rather portraying religion and religious people in a way that feels authentic and humanized and suitable for the near-future world he has constructed. Besides, it's just a damned fun book. Sure the plot isn't very well developed or well paced, and there are moments where the colorfulness of the Budayeen and its residents gets to be a bit too much. But it's good enough, and has a neat, hardboiled feel throughout.